Want to learn more about Google? Extrapolation can be dangerous. You’ve been warned. Good keyword search volume data is hard to find. Google’s AdWords Keyword Tool becomes the inevitable fallback. It’s plenty effective for generating large lists of head terms and long-tail key phrases. It’s not always so reliable when it comes to organic search volume. Inexplicable day-to-day fluctuations and a lack of organic data spell the need for alternative sources. After all, this tool was built for AdWords campaign managers – not SEOs. Search volume is really just a suggestion. A suggestion is fine. We’d like to enlist multiple suggestions, if possible. A second or third opinion can be the difference between detonating a flea bomb and moving to Cabo San Lucas. In this post, we’ll call on Dr. Bing and Excel, MS to reevaluate our prognosis. B-I-N-G- Oh, That’s Pretty Cool! What is cool, you ask? Bing is cool, I say – as of late, at least. Bing Webmaster Tools is happenin’, to say the least. The recent upgrades (all of which seem to cater to the SEO) have sparked a new, vested interest in the suite of tools and reports, effectively revitalizing Bing’s webmaster appeal. One of the raddest of these upgrades is the Keyword Research tool – a tool that has a functionality similar to that of the AdWords Keyword Tool, but instead reflects the actual organic search volume of each keyword (within a custom or pre-defined time constraint). Find it on the left sidebar in BWT, under ‘Diagnostics & Tools.’ Let’s dump some of my childhood-favorite reads into the keyword field and give it a whirl. We have selections from Dr. Seuss, Eric Carle, Chris Van Allsburg, and Shel Silverstein. Checking the box labeled ‘Strict’ is the equivalent of checking ‘[Exact]’ in AdWords, so you’ll want to do that before you execute the search. Notice, also, that you can set a custom date range, as I’ve done in the example above. Lastly, make sure to select ‘United States’ in the ‘Country/Region’ drop-down menu. Once the tool has done its business, the organic search volume data will be displayed for each of your phrases, along with a number of suggested terms. When you export the report, you’ll notice that, for both your terms and the suggested terms, data is included. Again, we have a column for both ‘Strict Impressions’ ([Exact] match) and ‘Appeared in Search’ (Broad match), both of which will come to good use in our keyword research efforts. Fresh, organic keyword search volume data. It’s a great day to be alive, isn’t it? Hm. It is, of course; however, let’s not forget that we’re looking at Bing keyword data. What about organic referrals coming from Yahoo!, AOL, or even Google!? Let’s take a look. Admittedly, this is where things get a tad tricky. We’re going to grab our Bing keyword data, throw it into an Excel spreadsheet, and extrapolate it market-wide. Our data won’t represent the organic search volumes of keywords for one search engine; it will represent those for all search engines. There are two essentials when it comes to making this work. The first is a dose of healthy ignorance. I’m not misplacing my modifier; I mean that ignorance can be healthy. Is the demographic that uses Google identical to the one that turns to Yahoo? Not a chance. Is it close enough? Probably. Do some of the low-volume queries that users search for on Google get essentially no play on Bing, Yahoo!, or AOL? Definitely. Will the lack of data result in a cataclysmic skew of our extrapolation? Doubt it. However, it is for these reasons that this method of keyword search volume research will never be anything more exact than an approximation – an estimate. That’s pretty much what we’ve got now, though, right? Right. Note: This lack of Bing keyword data will turn up with many long-tail (and some not-so-long-tail) term variants. Unfortunately, no data means no extrapolation. Secondly, we’ll need Bing’s U.S. market share (percentage) for the time period in question. As this is typically updated on a month-to-month basis, it’s a good idea to confine your keyword data to one-month periods. If we take a look at comScore’s recent report, we see that Bing’s share of the market for the month of June was 15.6%, an increase of .2 from its 15.4% in May, 2012. 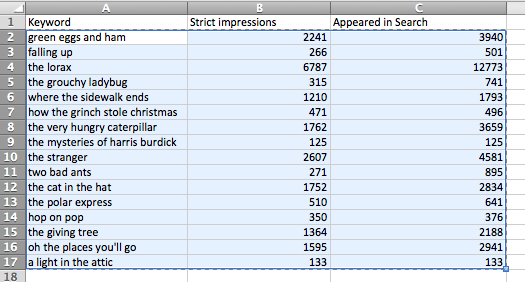 Awesomely enough, these figures are based on – you guessed it – organic search queries. Okay! We’re good to go! Let’s see how popular these key phrases really are. We cooked up an Excel spreadsheet (which you can download here) that makes the whole extrapolation process as simple as copy and paste. Let’s take a step-by-step look at how everything works. Great name, right? I thought so. Anyways, let’s dive into the process of churning out some market search volume totals from our Bing keyword data. This is pretty self-explanatory. Just grab your keywords and both columns of search volume data (without the headers), and copy. This data will be pasted as is into your spreadsheet. With your spreadsheet open, add the month-specific Bing search market share to the cell with an orange fill and thick borders. As the data that I collected was from the month of May, I used the number 15.4, rather than June’s 15.6. Note: This should always be formatted as a number, rather than a percentage. After you’ve entered the market share, click in cell A6 (the first cell under ‘Keyword’). Go ahead and paste in your Bing keyword data. It should line up perfectly with the three left-most columns of the spreadsheet. 3. Celebrate Good Times, C’mon! At this juncture, the two right-hand columns of your spreadsheet should be populated with data. You’ve done it! You’ve officially estimated the total organic monthly search volume that your key phrases see across the entire U.S. search market! All from a mere 15% of the total data! Pretty cool, huh? On the spreadsheet, we can use another absolute reference (the cell with blue fill and thick borders) to include the Google market share in our equation. For those of you who’d like to play around with this, I’ve included a separate spreadsheet that incorporates the Google market share. It includes two extra columns – one for ‘Google Strict Impressions (Exact)’ and one for ‘Appeared in Google Search (Broad).’ You can download it here. Something you might consider trying is comparing your extrapolated Google data to the data that AdWords provides for the same set of keywords. My first-grade favorites are plenty popular, but the extrapolated volumes come in short of those provided by AdWords. In reality, is extrapolating the data from 15.4% of U.S. search queries a methodology that lends itself to precision? Absolutely not. When it comes to keyword research, though, I’m not sure that it’s precision we’re looking for. Instead, we’re looking for estimates – for ballpark figures. For suggestions. Does it make more sense to use the keyword data Google provides, and then extrapolate from 67% of the market share (a much more statistically significant sample). I don’t think so. Bing has done us the great service of providing legitimate, organic search query data. This data represents a real organic sample – not just the queries that trigger advertisements. When available, it takes precedence, in my mind. If you have any questions, comments, or troubles with the spreadsheet, feel free to leave a comment below. Unlock the precision required for media buying at scale with these three features in the Google Display and Video 360 platform.